The Super Bowl score may have been settled on Sunday, but results from the broadcast's ads are just now coming in. Place your bets: It's time to reveal which commercials came out on top. We've put together the 10 most viral Super Bowl ads, based on Internet views worldwide. Online video analytics firm TubeMogul compiled the numbers, taking into account both official and pirated versions of the videos. The data includes views from Super Bowl Sunday through Wednesday night. So grab your chips and dip (if, of course, you have any left), and read on. You don't even need 3D glasses this go-round. Heeeeere's desperation! 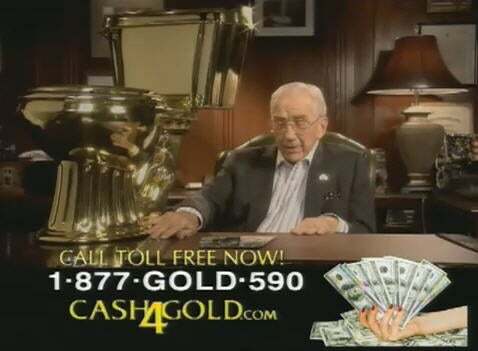 Our list kicks off with Ed McMahon's stint as a spokesperson--er, sorry, a spokesperson and a client--for Cash4Gold. The ad, which reeks of late-night infomercial, somehow snagged 1.3 million views across the Web, securing its spot on the countdown. If McMahon selling his gold hip replacement isn't enough, you also have MC Hammer hawking his shiny parachute pants. Dignity was always one thing that guy couldn't touch. The Pittsburgh Steelers' Troy Polamalu pays homage to 1979's famous "Mean Joe" Greene Coke ad in this updated Super Bowl spot. Instead of the sappy sweet ending, though, Polamalu takes out the annoying Coke brand managers who are always complaining about how Coke Zero stole their taste. The move seemed to be a touchdown, too: This ad scored a full 5000 views more than McMahon's, sliding into our ninth spot. People may be complaining that the hotly hyped 3D technology in the Super Bowl spots fell flat, but that didn't keep three NFL players' dance with the Sobe Lizards from soaring to eighth place on the most-viral-ads list. Matt Light, Justin Tuck, and Ray Lewis donned what can only be called "tighty-whities" as they broke it down with the reptiles. Add some monsters and aliens, and you have yourself 1.4 million online views. Taking the title of "Most Roundabout Way to Get People to Purchase a Product," Pedigree's Super Bowl commercial cranked out bison, boars, and ostriches--all just to convince you that dogs are the best pets (and, presumably, that you should feed them only Pedigree chow). I can mock the ad all I want, but I may be barking up the wrong tree: Pedigree's Super Bowl silliness scored 1.5 million views, putting it in the number seven spot. Pepsi created the hodgepodge stew of Super Bowl ads with its 2009 "Refresh Anthem." The commercial features Bob Dylan, Will.i.am, skateboarding, the military--and I'm pretty sure I saw Gumby somewhere in there, too. The message seems to be that though culture changes from generation to generation, Pepsi remains a constant force. If only they had included MC Hammer, I'd have been sold. The stew served up a meaty 1.8 million views, though, so plenty of people appeared to have an appetite.